Everyone's heard of the Circadian Rhythm - the 24-hour clock - but have you heard of the Infradian Rhythms? These are biological cycles that govern activity and process over periods longer than a single day. One very interesting lesser-known, biological rhythm is the Circannual Clock. This fascinating cycle governs biological processes that occur in every living creatures over a period of approximately one year. It dictates functions like migration, reproduction cycles in plants and animals, and even the human monthly cycle. It explains why plants know what time of year to grow and flowers to bloom. The Circannual Clock has a knock-on effect on our Circadian Rhythm, which when there's a misalignment in our behaviour, can cause us to feel a little off-kilter. In the summer days, the long sunny days naturally make us feel happy and über productive. This is when the Habituation Effect can establish itself. We very quickly fall into a routine and subsequently have an expectation of good mood and active behaviour. But in the winter months, especially in northern latitudes where the daylight hours are especially short. This causes a rapid shift in sunlight-induced happiness and a drop in productivity levels. Our sleep needs change as the seasons' change. About 20% of us notice low-level winter blues which can that affect your sleep quality needs, including lower levels of energy. We end up needing between 1.75 - 2.5 extra hours of sleep each night. So, we need to think of the winter months as a hibernating, restorative period in your annual cycle. We do however have a tendency to oversleep in this time - which not healthy for us either. Luckily, we have some amazing technology available to help shape our behaviour and provide us with the happiness boost we need. Make use of the so-called SAD lamps which mimic the sunlight in the morning to help you bounce up in the morning when is still dark outside. In the same vein, nature antidote to the blues comes in in red! 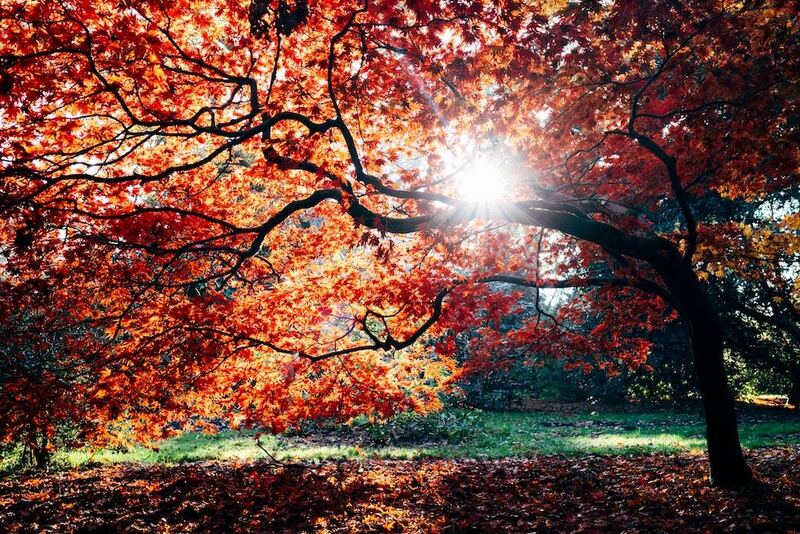 Looking at the research behind colour therapy, I believe that the warm colours of the autumn leaves and colourful sunsets are nature’s way of combatting the depression induced by the decrease in daylight hours. When we see the shades of red, it sparks off electrical impulses in the brain and magnetic currents cascade throughout our body that are prime activators of the biochemical and hormonal processes in the human body - that either stimulate or calm the body’s processes to maintain balance . The warm colours, such as reds, oranges, and yellows, are activating by increasing blood flow and stimulating the release of dopamine and serotonin, which are the ‘happy’ hormones. So, looking at the red leaves in autumn gives as just the mood boost we need to get through the dark days. 1. Reframe productivity expectation. Mindful philosophy stipulates that our distress is caused by a disparity between our expectations and reality. In the winter months, recognise the law of impermanence - that seasons change and so must we - adjust your productivity level expectation and see this time as an opportunity to rest and restore so that you are better prepared to be more productive in the summer months. 2. Practice self-care. Take time and invest in what restores and nourishes you. For example, take more restorative classes, read books that feed your mental and spiritual growth, and connect more with your loved ones. 3. Try the Autumn Colourscape Meditation. When you step outside, take a moment to look up at the sky and around the trees. Take in the colour, shades and tones of the tree leaves; appreciate the beauty of nature and how it is looking out for you. Focus your attention on a magnificent tree that is rich in reds, oranges, and yellows. Follow the rhythm and flow of your breathing as you allow the autumn colours to impact your mind and body wash over you. Turn the corners of your mouth slightly up as if you are about to smile. Notice the subtle sensation of your heart filling with joy as corners of your mouth tug on your heartstrings. Try this for 20 min at the same time daily to begin to feel the benefits.